Customers demanding large capacity will find the DiskStation DS2415+ very attractive. Move to bigger models if you need 10GbE speeds. NASes are becoming more common, not just in the office space, but at home. As faster Internet connection speeds become more common, it's likely that more storage space will be required. But what if you stored everything on your PC? While we suspect a lot of people take this approach, the better approach would be to store media and archival files on a NAS, making the files accessible to any client PC, regardless of whether a "main" PC is down. Last time, we took a look at QNAP's beastly TVS-871 NAS; this time, we look at an equally compelling option from another big name in the NAS business: Synology. Before we continue, we'd like to point out that the vast number of home/casual users wouldn't need the product in this review. However, for business users and home users with a serious need for data capacity, redundancy, and availability, extra consumer-oriented features such as HDMI output aren't necessary. For the detailed list of specifications, check out Synology's page on the DS2415+. It's necessary to note that the DS2415+ doesn't offer 10GbE expansion, so you're limited to 1Gbit infrastructures. If you want higher throughput on the DS2415+, you'll need to enabled link aggregation and have a network switch that supports 802.3ad. The front's design is simple. Drives are removed by pushing in the lock side side of each cage. For those who might be relocating, we recommend removing all drive cages before transporting the NAS, as the unit is very heavy when fully loaded. Even with drive cages locked, it's possible to have a cage come loose with enough force. The rear of the DS2415+ is equipped with four USB 3.0 ports, four 1Gbit Ethernet ports, a console port, and one DiskStation expansion port. There are dual "smart" 120mm exhaust fans on the rear that operate in high speed mode one the system detects that one fan has failed. You can of course, replace the fans if you wish, and as long as they're PWM fans, the failover feature will stay intact. On the rear of the DS2415+ you'll find four 1Gbit Ethernet ports that can operate individually or bonded under 802.3ad link aggregation. This means that you can technically bond all four ports for a total maximum throughput of 4Gbit/sec, but under link aggregation, you'll need multiple IO transactions to take advantage of the extra bandwidth. With a single file transfer, you won't go above the bandwidth of one single link. You'll also need a managed switch that supports link aggregation. For the best throughput, it's still best to have a fatter pipe. The DS2415+ does not have 10GbE expansion capabilities. Synology claims a maximum aggregated throughput of 451MB/s reads and 415MB/s writes when all four Ethernet ports are bonded. For our aggregation tests, we bonded ports 1 and 2, and 3 and 4 on the XS708E. The DiskStation DS2415+ is packed full of features such as: OpenERP, web hosting, Plex Media Server, WordPress, VPN Server, and a host of others that are all available as appliance downloads through Synology's Package Center. Other more advanced features such as VMware vSphere and Windows Server 2012 virtualization are supported as well as lightweight application appliances. The Intel Atom CPU inside the DS2415+ isn't intended for heavy-duty purposes, but the DS2415+ isn't positioned as an all-in-one server—it's primarily targeted as a storage device. Synology's application repository isn't as expansive as QNAP's, but it has most of what you'll likely be using the DS2415+ for. One interesting feature is Synology's CMS, which is a central management application used to manage multiple Synology NASes through one NAS. Above, you can see the DS2415+ managing an eight-bay Synology DS1815+. Through CMS, you can manage all aspects of the other NASes, including installing and removing appliances, volumes, etc. If you have multiple Synology NASes, CMS is a ultra convenient utility to have. With CMS enabled, two-factor authentication must be disabled, which reduces security. Hopefully, Synology will find a way to support two-factor authentication. You can use Google Authenticator with any Synology NAS running a recent version of DSM. The DS2415+ also comes with what Synology calls High-Availability, which runs a heartbeat daemon that syncs and failover between two Synology NASes. HA is available as part of the DS2415+ and so there's no added cost for the feature. For high-availability to work, you will be required to use two Ethernet ports per NAS and one will act as a passive server, only kicking in if the first one succumbs to a severe failure. We suspect business users will find this solution useful for mission critical data integrity. We configured our DS2415+ with 12 (yes, all 12 bays) Seagate Enterprise NAS 5TB drives, giving us a total raw capacity of 60TB. Seagate offers its Enterprise NAS drive in capacities up to 6TB. We previously used desktop-level NAS drives, but for a NAS with 12 drive bays, we highly recommend going to enterprise-level drives from your favorite vendor. With 12 drive bays, there's increased vibration through the NAS chassis, although the DS2415+ does a good job of keeping vibrations to a minimum. Enterprise NAS drives have several key difference that make them more reliable, such as spindle motors that are mounted and fixed on both ends. Desktop drives, on the other hand, have the motor mounted to the drive body only at the motor's base. Synology supports SSD caching in the DS2415+ for faster read/write performance, but you'll be required to use two identical SSDs. The DS2415+ will automatically create a mirrored cache between the two SSDs. We did not test with SSD caching. We used RAID 6 in our configuration since we're using a set of identical drives. However, Synology offers what it calls Hybrid-RAID, which allows users to mix and match different hard drive capacities to expand a RAID volume. 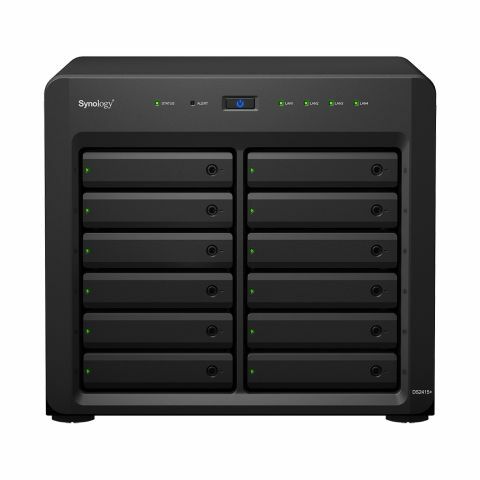 For situations where obtaining a full set of identical drives isn't economical, Synology Hybrid RAID elevates traditional RAID volume drawbacks, such as having to destroy and recreate an array when upgrading. SHR is offered in single- and dual-disk failure formats (similar to RAID 5 and RAID 6, respectively). However, Synology admits that there's a slight performance hit to using SHR versus a classic RAID setup. The benefit, of course, is the support of drives of varying capacities as well as space optimization. To increase the capacity of a classic RAID setup, all drives in the volume must be upgraded. With SHR, you can upgrade any drive at any given time. An interesting scenario one might consider is a full volume upgrade. Take our DS2415+ with 12 Seagate Enterprise NAS 5TB drives as an example. With SHR enabled, we can technically upgrade the entire array to 6TB drives by removing one drive at a time and replacing it with a larger-capacity drive. In single-drive failure SHR, we would let the array rebuild and then repeat the procedure with the next drive. Granted, this isn't a very fast way to upgrade a volume, but it does make it possible to do a capacity upgrade while hot. If you plan to go down this path, we recommend using SHR with two-drive failure support instead of one-drive, so you don't put your array in a risky degraded mode during the upgrade procedure. We tested several features of the DS2415+, including RAID fail, rebuild, and throughput. We also tested dual link-aggregation mode from NAS to NAS. Note: Thanks to CyberPower PC for supplying the Samsung 850 Pro 1TB SSDs! Clearly there's performance gains to be had in link aggregation mode, which is where you can see substantial throughput gains. Strictly speaking though, link aggregation performance depends more on simultaneous I/O threads and doesn't at all help single threaded operations, such as copying one file at a time. Mixed file size copy operations of a 1TB folder performed at a more modest 97MB/sec, which is still excellent for 1Gbit networks. If you're using Windows as a client OS, iSCSI support is built in. You can launch the iSCSI initiator and simply enter the IP of the NAS. Once added, you'll need to go into Disk Management and initiate/format the iSCSI LUN as you would a normal disk, giving it a drive letter for access. Performance is similar to file-sharing protocols such as SMB and AFP, with the major difference being that iSCSI is a block-level protocol. You can format an iSCSI target to any file system you desire, such as NTFS or HFS. However, because the iSCSI target behaves like a real mounted drive, the LUN is locked to a single client (you can create multiple iSCSI LUNs on the DS2415+). Also, keep in mind that you won't be able to use link aggregation in conjunction with iSCSI. Lastly, you'll have to be mindful about properly connecting and disconnecting an iSCSI LUN. Synology's DiskStation DS2415+ packs in a lot of features for small-to-medium size businesses, and we can imagine plenty of verticals where a 12-bay NAS makes a lot of sense. There's plenty of room for storage expansion, and if you run out of space, the DS2415+ supports an additional 12 bays via Synology's DX1215 expansion unit. We have just a few minor complaints about the DS2415+. First, there's no support for RAID 50 or 60, but we reckon this could be added via new firmware. Second, at larger-capacity configurations, 10GbE support would have been nice. While quad-port link aggregation is good, having a fatter pipe is better. Synology also needs to fix the two-step verification caveat with CMS. The ideal scenario for the DS2415+ is that of volume, lots of it. While the DS2415+ supports features that consumers may find useful or entertaining, it performs best as a gargantuan storage repository. At this point in time, it supports 8TB drives, giving a total raw capacity of 192GB if you add in the DX1215. If you're running a substantial image/video heavy operation, you'll find the combo highly attractive.